Oh gotcha. Thanks. 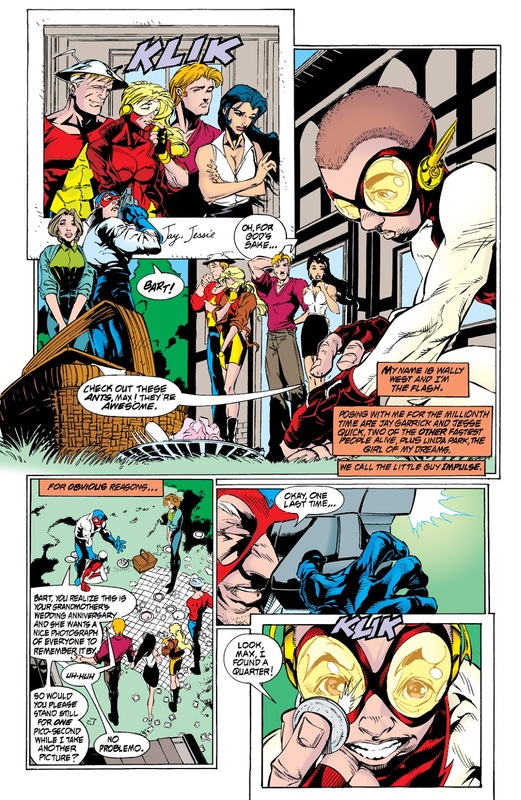 I really liked Emergency stop I also thought the lightning suit Wally made for himself was awesome. Wouldn't mind seeing it again. I agree. I didnt really care for most of Wally'a artists. Greg Laroque is the best for me and the classic Wally artist. He was also on it for so long. I really liked Oscar Jimenez as well. And Paul Ryan was pretty good. I did not like Weringo. Too cartoony and Wally had a really square jaw. Didn't care for Scott Kolins either. And as you mentioned the Black Flash and Ignition arcs were pretty bad art wise. More recently I really like Duce on Wally. I would have picked him for a Wally ongoing. Oh, good: I'm not the only Not-A-Fan of Kolins work. For all of a few minutes I liked it when I first ran across in 2009. After that minute was gone however.... Meh. Can't really explain why either. Too weighty? Like the difference between water color and heavy acrylic oils. While Weringo was 'watered down' watercolors in a Bugs Bunny cartoon. I liked it in small bursts in the Impulse trades, but would hate to have to see those caricatures all the time. (Was a bit jarring to go with both that and more 'realistic' styles while reading the trade of Dead Heat with the Impulse tie-in chapters. Doesn't really work well at all. Edit: Unlike with the movie Space Jam where real actors interacting with the Looney Tunes gang was quite fun. Last edited by Kyer; 11-02-2018 at 07:48 PM. The thing about the art that really gets me distracted from The Black Flash, it's how Bart looks in the first part. Oh wow, yeah, I hated Pop Mahn's art. Most of the artists who worked on Wally's comic ranged from good to great, though. What I don't like about Kolins that I can articulate is his lines are way too thick and everyone has squinty eyes and puckered lips a lot. I think your talking about Humberto Ramos for the Impulse tie in issues for Dead Heat. It was pretty bad. He worked for the cartoony Impulse in general but those particular issues were terrible. Even as a small kid seeing that I was like what the? Norm Rapmund is a huge Wally fan and puts up some awesome sketches of his. Here are some recent ones. Reminds me of Todd Nauck. Oh... those are good. I want every one of my Wally trades redone by that artist. I remember when Pop Mahn's art first appeared and it was the first time I really didn't like an artist's work on the book. And it wasn't like 'Ringo, where it grew on me to the point where I ended up loving it, I just cringed every time I saw his name on the cover. That said, I will say I find his recent work much more appealing. As a reader, I always thought us Flash fans were VERY lucky in regards to the artists we were given. From Infantino, Andru, Novick, Saviuk, LaRocque, Jimenez, Wieringo, Ryan, Kolins, Pelletier, Porter, Manapul - not a bad list! Agreed. We have had many great artists to draw this handsome devil. Also apparently today is Nation red head day so Happy National red head day Wally fans. Happy red head day! Always be my favorite color . Catching up on some classic Wally. Always fun to see old pics like that because I recognize the old furniture styles! To this day when a story says someone is going to reach for a phone I still first expect to see a rotary phone and not a cel.
. . . To this day when a story says someone is going to reach for a phone I still first expect to see a rotary phone and not a cel. I still have a rotary phone somewhere (I think) . . . can't remember if I actually used it since the turn of the century or not. Very close relative used to work for "Ma Bell" before the breakup in the 1980's. We had rotary phones here, there, and everywhere! I kind of miss the dialing motion even if it was much slower.